By 1925 there were a number of different companies making paper fasteners using different solutions. You have the single-stroke staplers as exemplified by the Novelty Paper Fastener, magazine fed staplers using an early form of cohered staples exemplified by the Acme Sure Shot, stapleless staplers exemplified by the Bump and Clipless fasteners, and strip staplers exemplified by the Hotchkiss No. 1. These four represent the major technologies at that time. Single-stroke fasteners were obsolete by this time and although still sold they were not used much in business. Bump-method fasteners were (and still are) used but never achieved widespread adoption because of the fastening limitations of this technology. It should also be noted that the Bump Fastening Method was patented in 1911 making this a relatively new technology when the Greenfield was introduced. 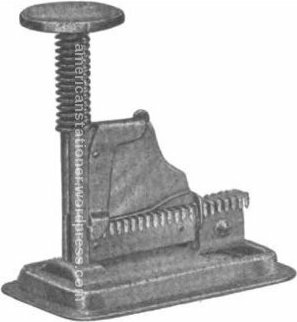 Magazine fed staplers with cohered (or frozen wire) staples were becoming more common and eventually won the technology war but in the early 20th century this crown was still up for grabs as the competing and well-established staple strip fasteners were still popular and widely used. Today’s near-antique item is the Greenfield Stapling Machine. 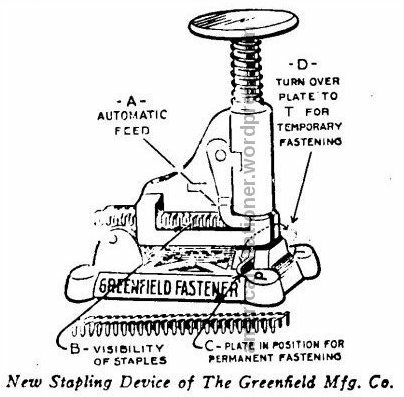 Introduced in April 1917, patented in 1914, the Greenfield introduced a number of improvements to the strip stapler. 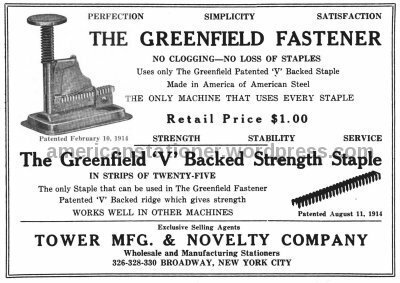 References to the Greenfield Stapling Machine are first found in advertisements starting in 1917. The company was still reported as manufacturing these in 1922 but it is likely they were available for at least a year or so after that. It also appears that the Greenfield was referenced in a number of different ways during its manufacture. 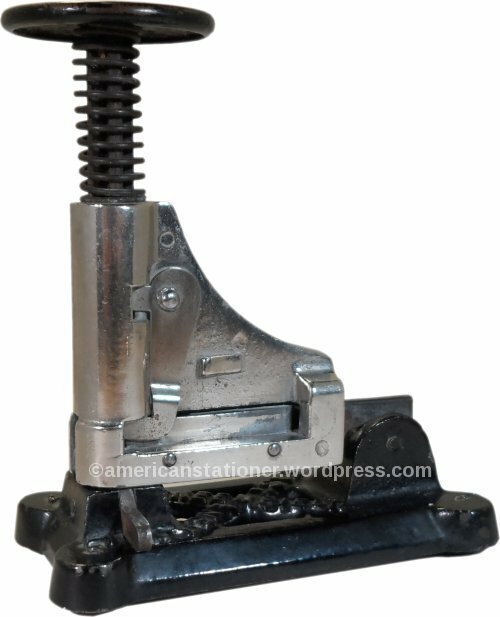 I’ve seen it referenced as; the Greenfield Stapling Machine, the Machine, Greenfield Stapling Device, Greenfield Stapler, Greenfield Paper Fastener, Greenfield Fastening Machine and the Greenfield Fastener. I understand that all of these descriptives are basically stating the same thing but this is the only office item I’ve ever come across with so many nomenclatures attached to it. This model of the stapler measures 4″ L x 2″ W x 4.6875″ H and weighs 14 oz empty. Compare this to the 20 oz that the Hotchkiss No 1 weighed. That’s a 30% weight difference. There are three known distinct models of the Greenfield which for convenience I’ll label as models A through C.
The model A (above) is the first known model. However, it should be noted that it doesn’t quite match the patent drawings. The two main improvements of this machine over the competition was weight and the “feeding dog”. The feeding dog is that inverted L-shaped part that runs from the top of the stapler down the front. Its purpose was to direct the feeding of the staples to the plunger and allowed the use of the entire staple strip. Other staple strip staplers couldn’t use that last staple because of the way they were fed. The model B had several minor improvements (which included a better “feeding dog”), a new design, and one newly patented feature. This newly patented feature was part of patent 1287584 and was an anvil stapling position lever (highlighted in the illustration above in yellow). This is the first known stapler that allowed you to choose either permanent or temporary fastening of paper. This new design is also reflected on patent 1287584. Oddly though, on the bottom of the base it still states “PATENTED FEB 10.14.” which is a reference to patent 1086362. It is unknown why the older patent is stamped on the base but not the newer one, or both. Note that the body of the illustration above does not show the feeding dog stop that is on the main picture above. This stop also doesn’t seem to be illustrated on the patent. I’m unsure if this stop was added later or if it was just an artistic consideration to leave it off the illustration(s). The model C seems to be the last version of this stapler. There are some obvious design changes but overall the differences between this and the model B are fairly minimal. Note the anvil stapling position lever highlighted in yellow above. Patent 1086362 which was for the original model stapling machine. This patent was granted on February 10, 1914. The second was patent 1106938 for a staple-strip. This patent was granted on August 11, 1914. The third was patent 1287583 for the “Art Relating to the Stapling of Sheets”. This patent was granted on December 10, 1918. The fourth was patent 1287584 for the models B and above stapling machines. This patent was granted on December 10, 1918. A fifth patent, 1024889, was the original patent for what would become the “feeding dog”. This patent was meant as a general improvement to staplers of this type but he is the only one to ever incorporate this feature as far as I can currently tell. This patent was granted on April 30, 1912 to Edwin Greenfield. The company that made the Greenfield Stapling Machine was Greenfield Manufacturing Company. However, the first reference I find for this company is in 1918. 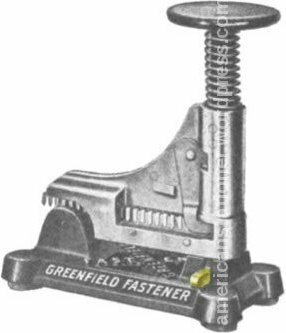 Patent 1024889 was assigned by Edwin Greenfield to the Greenfield Automatic Fastener Company and it is possible that the model A was released under their name. I can find references to the Greenfield Automatic Fastener Company starting in 1894 until 1912. The first reference I can find for the Greenfield Manufacturing Company is in 1918 and the last one is in 1922. As you can see, the dates above aren’t quite continuous. These dates are ones that I can find specific references to. It is likely, for example, that the Greenfield Automatic Fastener Co inhabited the 44 Broad Street address in New York from 1894 through 1918. However, I can only find specific reference for the year 1895. Speaking of 1895, I have come across a reference in an industry magazine which states; “The Jones Manufacturing Company, successors to The Greenfield Automatic Fastener Company, New York, office 44 Broad street, has brought out what is certainly a world beater.” To be honest, I’m not quite sure what to make of this reference. The story goes on to speak about the Greenfield Automatic Pin -Tag Machine. I can find no other reference regarding any kind of connection between Jones Manufacturing and the Greenfield Automatic Fastener Co.
Edwin T Greenfield was granted 83 patents (that I can currently find) between 1879 and 1921 (although I’ve seen written that his first patent was granted in 1866). Twelve patents regarding staplers and staples were granted between 1894 and 1918. He also had patents regarding telephones, telegraphs, electricity related, paper tubing, paper milk bottles, vehicle speed indicators, heating systems, process for making tires, parachute for removable seat in an aeroplane (the forerunner to an ejection seat), and various manufacturing machines. 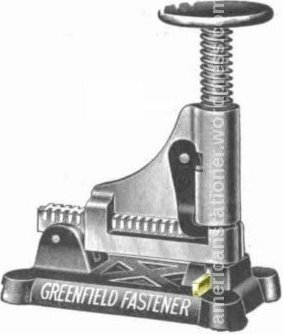 Greenfield also patented the spiral “tail” seen on early Hotchkiss staplers under patent 572293 in 1896. Born in 1847, Edwin T. Greenfield died April 2, 1920 at 73 years of age at his home in New York City. He was married three times in his lifetime. His first wife passed away of tuberculosis in 1879. His second wife died of a heart attack in 1915 and he married again in 1917. He and his first wife had three daughters. The first, Emma, died at the same time as her mother. The second two were named Sarah and Ida. He and his second wife then had a son whom they named Edwin. A self-made man, he had few advantages early in life. He enlisted in the Navy on September 7, 1861 in New York City shortly after the beginning of the Civil War. He was sent to the receiving ship North Carolina at the Brooklyn Navy Yard. On October 1, 1861 he was transferred to the Mississippi Squadron and served on the gunboat Linden, the mortar fleet, and the USS Tyler taking part in all of the major engagements on the river. He was in the Black River and Steele Bayou Expedition and in the Yazoo River Expedition when the Confederate navy yard in Yazoo City was destroyed. At the seige of Vicksburg he was wounded and afterwards promoted for his bravery in action. He was made a gunner and served until the closing of the war being discharged on June 13, 1865. Later in life, he was elected commander of the Alexander Hamilton Post of the G.A.R. and he was also Grand Marshal of the Grand Army of the Republic (G.A.R.) in New York City. He was always referred to as “Colonel” after being made Grand Marshal as a sign of respect. In 1903 Mr. Greenfield ran for the County Assembly in New York as a Democrat but lost. Besides the Greenfield Automatic Fastener Co and Greenfield Manufacturing, Mr. Greenfield started at least one other company. This was the Greenfield Paper Bottle Company. His paper bottles were made specifically for milk and were the forerunners of the modern milk carton. Early in Edwin Greenfield’s career he patented a very large number of electrical-related safety items for the Interior Conduit And Insulation Company. He is listed as their “Electrician”. Now, in the 19th century the title of electrician didn’t mean what it does today. In other words, he wasn’t considered a tradesman. Electricians then were a type of electrical engineer and was considered a subfield of physics. Edwin also worked with Thomas Edison as his aid in New Jersey and was close enough that Edison gave him personal gifts and kept up correspondence with him. In 1915 Edwin had been and was still working at General Electric. Edwin Greenfield was not only a prolific inventor, sailor, veteran, and politically active but a scientist as well, not to mention a successful businessman. One gets the impression that if Mr. Greenfield hadn’t passed away when he did then his Stapling Machine would have had much more success. As it is, it seems that all of Mr. Greenfield’s endeavours were either sold off or no longer in operation within a few years of his death. To William “Bill” Rumble, the great great grandson of Edwin Greenfield. Mr. Rumble sent me lots of information and helped direct me in further research of E.T. Greenfield. He also spent a good deal of time speaking with relatives in an attempt to provide a picture. 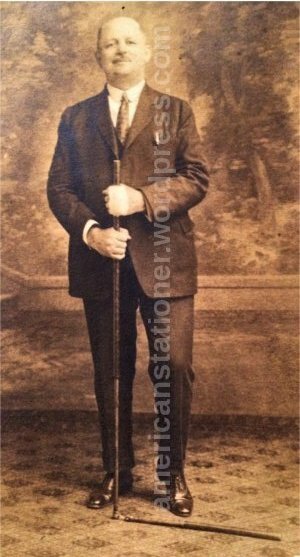 Fortunately, that hard work paid off and I have posted what is the only known photo of Edwin Greenfield. It’s always a bit of thrill for me to speak with folks with such a close connection to the pioneers in this field. It’s been a privilege to research and write about a person of such accomplishments as E.T. Greenfield.